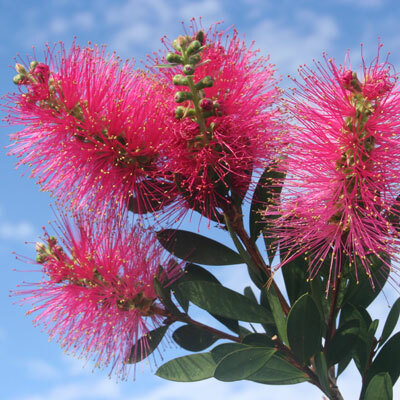 Callistemon Hot Pink will give your sunny garden a flower colour in Callistemons not seen before. Hot Pink suits the smaller areas we have in our gardens of today as it is compact and not too tall. Honey eating birds, bees and other insects are attracted in large numbers during the flowering season. In future, native gardens will not seem complete without plants of Hot Pink bottlebrush. Planted singly or in rows they will impress with their clean upright growth to 1.5m by 1m wide in most situations. The straight branches can be used to good effect in floral arrangements. If planted into a large pot one would need to take real care that the soil never dried out. Hot Pink behaves as all other Callistemons of our knowledge. They are easy to grow with minimal requirements. All shrubs need to be watered in well at planting and kept moist for several months until they have rooted well into the garden soil. Prune, if needed, to shape and size and is best done following the major flowering in spring. Mulch with any mulching material to 60mm deep to conserve moisture and to keep the soil cooler around the surface feeder roots. In most fertile soils little supplementary fertilizer will be needed but in Hot Pink's early life an occasional dressing of any well balanced fertilizer would be helpful. Callistemon Hot Pink is a selected progeny from a cross of Callistemon citrinus Splendens (formerly Endeavour) and Callistemon pallidus. It was bred in South Africa by a native plant enthusiast who has a real interest in the flora from that country and also Australian native plants. From Callistemon palliduss comes a dwarf habit and from Callistemon Splendens: the upright form. Plants had to be imported by Aussie Winners and held for two years in government quarantine before clearing because of the relationship with our native flora.